Clearly Jesus is calling the disciples to a life with him. But every “calling to” is by default a “calling from” in some sense. Fishing was not as easy as getting a boat and having at it. Fishing was controlled by the “powers that be” in two ways. (1) Commercial fishermen worked for the royal family or wealthy landlords who contracted with them to provide a specific amount of fish at a certain time. They were paid either with cash or with fish. (2) Fishermen leased their fishing rights from persons called “toll collectors” in the NT for a percentage of the catch. The “tax” could be as much as 40% (see Malina & Rohrbach, Social-Science Commentary on the Synoptic Gospels, p. 44). Perhaps noteworthy is that the brothers Simon and Andrew have names that are Semitic and Greek, respectively, in origin. It seems as though their names reflect the mixed culture of Hellenistic settlements just across the river from Jewish Capernaum – truly a “Galilee of the Gentiles” (v.15). Fishers of Men. 19 He said to them, “Come after me, and I will make you fishers of men.” 20 At once they left their nets and followed him. 21 He walked along from there and saw two other brothers, James, the son of Zebedee, and his brother John. They were in a boat, with their father Zebedee, mending their nets. He called them, 22 and immediately they left their boat and their father and followed him. The word for net (diktyon) used in v.18 is a general term for any kind of fishing net, but the term used here in v.19 (sagēnē) specifically refers to a “drag net.” At one level the phrase does bring up an image of the unwilling being netted and dragged into the boat/the church. Perhaps it isn’t so bad for parents to “drag” their children to church. Maybe we should “drag” more people into church, whether or not they want to come. Put up roadblocks on the street and force the cars into our parking lots! Or maybe the “dragging” indicates that the coming of the Kingdom is out of our control. We are going to be “caught” in its coming whether we like it or not. Generally we view being captured in such a way as a negative thing; but we also talk about being “captured by love”. The relationship of love is often something out of our control. It happens to us. When its power runs its full effect, it means a change in life — marriage is as much a dying to the old life as it is the beginning of a new life. That new life brings with it new relatives, whether we want them or not. Being captured by Jesus’ irresistible call meant an end to the old life and relations for the fishermen, so that they might start begin a new life together as followers of Jesus. But there is also more at play in the scene. Beyond the fishing metaphor, there is a tradition in ancient near east narrative, include Jewish writings of fishing being a call to a new life to participate in what God has planned. There is something about the call. The brothers are not told why they should follow, what following will mean, or where the path will lead. In a way, this is perhaps the first miracle in the Matthean narrative – the power of the Word of God that creates disciples – the Word spoken in a command (“Come after me”) and a promise (“I will make you…”). Matthew 4:18 Simon, who is called Peter, and… Andrew: The name Simon (cf. 10:2; 16:16–17; 17:25) appears much less often than the popular nickname Peter (23 times), which Jesus gave Simon in 16:17–18. In view of the prominence of Peter in Matthew, especially Matt 16:13ff, it is not merely coincidental that Peter is the first disciple who responds to the call of Jesus. Andrew, by contrast, is mentioned only once after this (10:2; but cf. John 1:35–42). On a linguistic note Simon is a Semitic name, while Andrew is a Greek name – likely reflecting the mixed culture of the Hellenistic Galilee. Matthew 4:19 Come after me: The call of the first disciples promises them a share in Jesus’ work and entails abandonment of family and former way of life. Following Jesus involved both traveling with him and obeying his teaching and modeling of God’s will. It could and did lead to hardship and peril (8:19, 22; 10:38; 16:24; 19:21). Three of the four, Simon, James, and John, are distinguished among the disciples by a closer relation with Jesus (Matthew 17:1; 26:37). It should also be noted that in both narratives it is Jesus who sees the prospective disciples and takes the initiative in calling them to follow him. This is an important factor in distinguishing Jesus as a charismatic or prophetic figure, after the model of Elijah, from the late Rabbinic model in which the disciples took the initiative in attaching themselves to the Rabbi (cf. m. Avot 1:6). fishers of men: This is an expression found elsewhere in the NT only in Mark 1:17. It is just possible that fishing here is an allusion to Jer 16:16, or that fishing for people implies eschatological judgment (13:47–50). In any event, this new “fishing” results in life for those “caught” by the message of Jesus. The occupation of fisherman could take one of three forms: (a) a tax collector, having a Roman franchise, who sold fishing rights to local businessmen, (b) a person who owned or leased boats and employed day laborers, and (c) the day laborer’s themselves. This distinction is helpful in locating the social class of Peter, et.al. It is likely that Peter belonged to the second group. 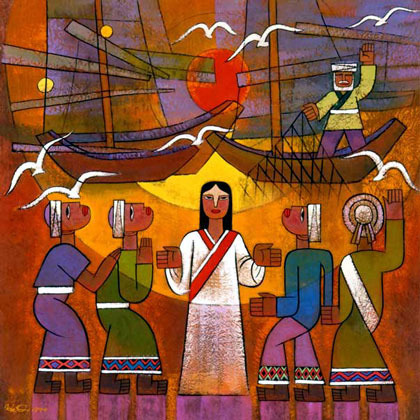 Matthew 4:20 at once they left their nets: Here and in Matthew 4:22, as in Mark (Mark 1:16-20) and unlike the Lucan account (Luke 5:1-11), the disciples’ response is motivated only by Jesus’ invitation, an element that emphasizes his mysterious power. For the similar story of the call of Matthew, see 9:9. This entry was posted in Catholic, Scripture and tagged calling, disciples, fishers of men, Matthew by Friar Musings. Bookmark the permalink.